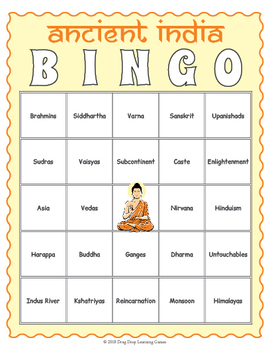 Your students will love playing this colorful and informative BINGO game which covers important vocabulary words for understanding the history of Ancient India. It makes a great introduction to the subject and a welcome fun break in the classroom. 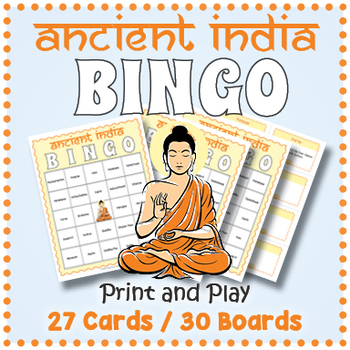 Included are 27 vocabulary calling cards and 30 unique bingo game boards. Each calling card includes the vocabulary word and a concise definition. You can call the definition and have students determine the vocabulary word to add an extra challenge to the game. The cards just by themselves also make an engaging learning resource. 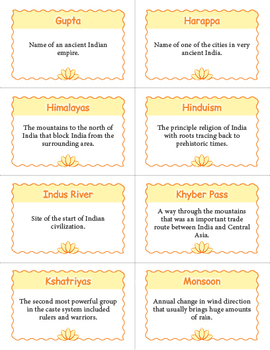 Print them twice and you are set to play a memory game. All of our printables are carefully laid out to minimize your work in creating a quality resource that can be used over and over again. 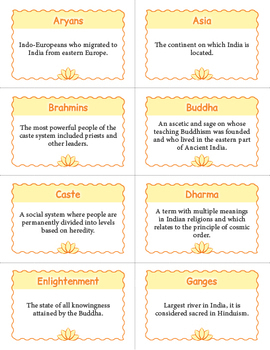 The words covered are: Aryans, Asia, Brahmins, Buddha, Caste, Dharma, Enlightenment, Ganges, Gupta, Harappa, Himalayas, Hinduism, Indus River, Khyber Pass, Kshatriyas, Monsoon, Nirvana, Reincarnation, Sanskrit, Siddhartha, Subcontinent, Sudras, Untouchables, Upanishads, Vaisyas, Varna, and Vedas.